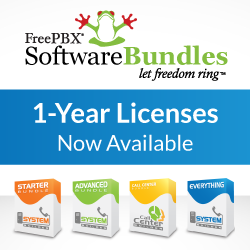 We are excited to announce the release of FreePBX version 2.3.1 today. Existing 2.3 installations can simply update their systems through the Online Module Admin repository by accepting the [i]FreePBX Framework[/i] and [i]Core[/i] module updates that are available online. This is the recommended upgrade procedure for existing installations that no longer requires you to download and install the new tarball. It has been almost 4 months since the official 2.3 program was started. With over 14,000 known systems having installed or upgraded to 2.3, it has proven itself to be the most stable release of FreePBX ever. We strongly encourage users of earlier releases to bring yourself up-to-date with version 2.3 as we will concentrate all our efforts on the current and future releases and their will be no more maintenance releases to earlier versions. Since version 2.3 supports both Asterisk 1.2 and 1.4, you should be able to run any installation with the current version of FreePBX. Next PostAre You Interested in a Training & Certification Course?